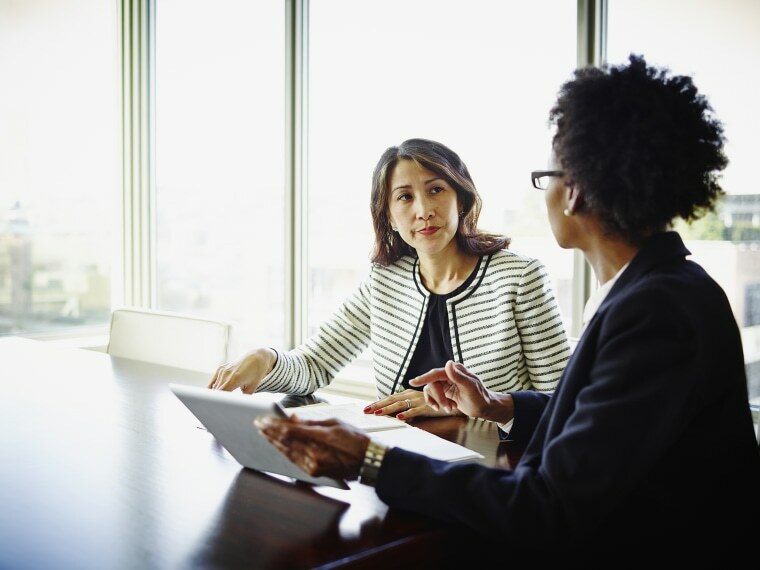 When preparing to ask for more money, consider your boss’s perspective in order to make an effective case for better compensation. Asking for a raise can be really difficult. In my position as an executive coach, I am often looking at raises from the vantage point of the boss – the person who doesn’t always want to give one! So I understand why it can be very challenging for an employee to not only garner the courage to ask, but also have success in achieving it. The first thing to consider: Do you deserve it? Why are you asking? Is it because you just want more money or is it that you deserve more money? Indicators that you deserve a raise are that you are either paid less for your position than the market rate or the value that you bring to the business and the team is greater than your current compensation. While your value is subjective, it can be assessed by what we call “how much” factors. How much money do you bring to the business, how much do you serve your customers, how much do you produce for the team and how much does the team or company count on you for success? If you feel you are greatly contributing to the success of the team and the larger organization, then you are in a good position to ask for a raise. Here’s how to do it. Employers have a number of concerns when it comes to giving raises and typically they don’t want to do it. For one, they like to keep the budget down in order to have flexibility with spending company dollars. Sometimes they don’t have the money to accommodate a raise easily. Once they give you the raise, they can’t go back on it so they want to pace their spending. They are also concerned about paying one person more than others and are always evaluating what they think the cost of the job is worth in terms of performance and results. At the same time, they want to give people raises to keep them happy, make them feel supported and to retain top performers. To overcome these potential obstacles, you need to create a bulletproof discussion on why you deserve a raise. Advocating for yourself can be challenging. You don’t want to appear too pushy or entitled, but you do want to ask for your needs and even demand that they be met. Attitude – You are willing and flexible to do all kinds of work with a smile. Execution – You complete multiple tasks in short periods of time without error. Vision – You are good at anticipating needs and seeing what’s coming next. Goal Oriented – You keep your eye on the bigger picture and achieve the goals you set. Results Driven – You deliver measurable results that benefit the organization. Hard Working – Simply put, you work hard no matter the cost. Team Player – People like to work with you and you help the team grow. Having a combination of the above traits will help your cause. To be clear, it’s not about bragging, it’s about clarifying value. If you are successful in most of these areas, bosses will not want to lose you and will want to make you happy. Not coachable – You’re not open to feedback and/or you get feedback but don’t change. Low Impact – You’re easy going, but not making a difference. High Maintenance – You are always asking for things or complaining. Big Ego – You overvalue your contributions. Lazy – You don’t go the extra mile. Bad Attitude – You are not willing to do the hard work or are inflexible. Lack Grit – You can’t handle the pressure or failure. These are unattractive qualities that overshadow talent and intelligence. Even if you are driving good results, these qualities are tough to overcome. This doesn’t mean you have to be popular, but you do need to have a good work ethic and values. Most importantly, stay focused on your mission. Your goal is not to ask for the raise; your goal is to get one. Make sure that the way you see yourself is how others see you as well. While you need to consider the boss’s perspective in order to shift a “no” to a “yes,” don’t let that intimidate you. You don’t have to be popular or a superstar to succeed; you just have to be making enough of an impact to move yourself another step forward. If you do not feel you are succeeding in the areas that provide value, then do not move forward with asking for a raise because it could backfire. If you do get rejected, ask for feedback and find out what they are looking for in order for you to advance your pay. Challenge them and don’t let them get away with just shutting you down without thinking it through. Once you know what they are looking for, make those shifts and come back again in 6 months. You are your greatest commodity. You always need to be fine-tuning your skills, evolving your talent and getting paid what you deserve. Set goals for what you want to earn and build yourself toward that number. Continually ask for feedback, align your vision with your boss’s and drive for the result. You can do it!